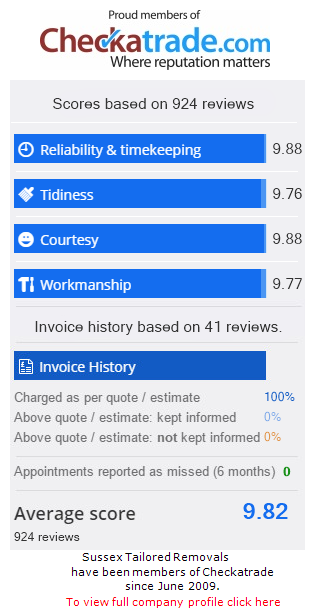 Sussex Removals Ltd - Over 600 Positive Checkatrade Reviews! A Complete Removals, Packing & Storage Solution. Peace of mind is everything when you’re moving between properties. Our aim at Sussex Removals has always been to deliver outstanding customer service and professionalism. You’ll find that we offer a wide range of services from domestic removals and packing, to storage, international shipping and freight forwarding. Sussex Removals is a long-established local firm, and over the years we’ve built a solid reputation for being reliable, efficient and competitively priced. 500 Reviews on Checkatrade.com confirm that our staff are polite, courteous, and knowledgeable about their work. To ensure your move is as easy and relaxed as possible, we will carry out a site survey at your home address, talk you through the options, and discuss your specific needs in detail. We can offer bespoke services – you might want a basic load and unload to your new address, or you might opt for a complete packing service. You may have unusual items to move such as a piano, IT hardware, fragile ornaments or sports equipment. Please be aware we are not related, nor associated with, and have nothing to do with www.sussexremovals.com who are based in Peacehaven who are not a checkatrade member or a Ltd company. If you have been redirected to this page by them, you should be speaking to us to do your move.